Forget politics. It’s time to discuss the only truly important thing about the weekend of January 20th - the clothes! Whatever your political stance, you have to admit that the Trump women looked pretty dang good that weekend! Now, it’s not that I’m envious or anything, but Melania and Ivanka both wore dresses that I would cheerfully exchange body parts for. Both of them obviously know their style and their bodies perfectly and choose clothes that flatter and fit flawlessly (how’s that for alliteration!) and are chic, timeless and classic. The next time I’m invited to a ball, or an inauguration (I know, I couldn’t believe I wasn’t invited either!) I’ll be sitting with Melania and Ivanka because they’ll make me look good!!!!! The Inaugural Balls were THE place for the First Lady and the First Daughter to shine. Ivanka, on the other hand, looked like every little girl’s image of a princess in a champagne and crystal ball gown by Carolina Herrera. They were both the perfect foils to the menfolk who wore classic black tuxedos. 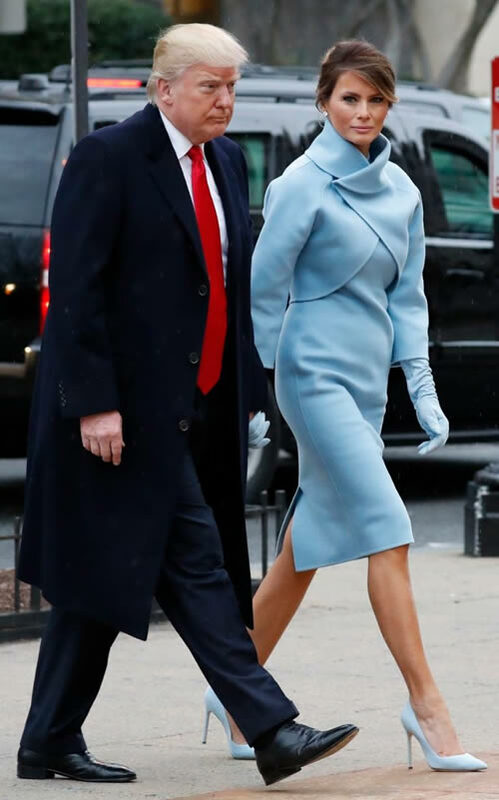 In contrast, the inauguration itself saw a different spin on fashion, when both Trump ladies wore monochrome outfits - Melania in a perfect ice blue Ralph Lauren dress, bolero jacket, gloves and pumps and Ivanka in a white Oscar de la Renta pantsuit. That may have been the only fashion miss of the weekend - I didn’t like Ivanka’s long coat. It buttoned under the bust and, I thought, pulled when she moved. Anybody else think so? But, as far as Melania’s“Jackie Kennedy-esque” outfit, this is the quintessential argument of style over trend. Jackie Kennedy wore monochromatic coat/dress combos 50 YEARS AGO!!!! And we’re still talking about them!!!!! Obviously Mrs. Trump is not jumping on a trend here! And speaking of style over trend, could anything have been more stylish than Mrs. Trump’s Reem Acra gown from the Candlelight Dinner? Will a perfectly cut, form-fitting dress in a neutral metallic fabric ever NOT be in style? Put a perfect body in it and you’ve got a look that transcends trend and yet never goes out of fashion. So, did I have a point to all this raving? Yup. It’s simple. “Trend” is today but “style” is forever!